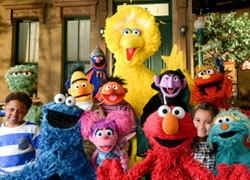 Discussion in 'Classic Sesame Street' started by minor muppetz, Jul 7, 2011. I thought it might be fun to speculate on the timeline of the Monsterpiece Theater segments, to try to figure out the years various installments premiered, and to note when certain changes might have occurred. Season 11 - the premiere of Me, Claudias (according to the 40th anniversary DVD), which seems like it must be the first Monsterpiece Theater segment. The music premieres here, but there's no Monsterpiece Theater title card, the main set is different from later segments, being a bright green color (as far as I know, the only time this room was used on Monsterpiece Theater). This is also one of the few segments to have a title card for the featured story (which is shown again at the very end). Then there was Upstairs, Downstairs, which I think must have premiered in season 12 or 13 (though the packaging for the Alistair Cookie doll cites 1978 as the debut of this sketch). The set is different from Me, Claudias, resembling the usual set better but still noticably different (and as far as I know the only time this set is used). The first Monsterpiece Theater title sequence is introduced, though an announcer introduces the segment (I guess it was redundant to have an annoucner introduce the segment and Alistair Cookie when Alistair Cookie introduces himself and Monsterpiece Theater immediately afterwards). This segment ends with a shot of the Monsterpeice Theater title card, in almost a reverse of the opening. A number of later segments (Chariots of Fur, Gone with the Wind, The King and I, and The 400 Blows) also end with a shot of the title card, but it doesn't go in reverse. Then there's Chariots of Fur and The Sound of Music. Chariots of Fur seems to debut in season 13-15 (the season 15 premiere is the earleist-known appearance), and The Sound of Music seems to premiere seasons 13-17 (The Muppets: A Celebration of 30 Years shows a brief clip from The Sound of Music in it's Sesame Street montage, meaning it was around by 1985). But with these segments, the segment looks closer to how it looks for the rest of the decade. There's no longer an announcer, and the segments now have the usual introductory/closing set, which inclues a painted backdrop of books on bookshelves as opposed to actual bookshelves with actual books. In these two segments there's another, smaller set of bookshelves next to the longer set of bookshelves, which seems to be removed later on. Also, with Upstairs, Downstairs, Chariots of Fur, and The Sound of Music, Cookie Monster just wears his robe. In all other Monsterpiece Theater segments I've seen (including Me, Claudias), he wears some kind of shirt underneath his jacket. After that I don't know if there are any new segments made until season 19, but by then it seems that Monsterpiece Theater is produced on a more regular basis. There's at least three segments made in season 19: Ali Baba and the 40 Thieves (the show didn't start teaching kids to count to 40 until season 19, and the earliest-known appearance of that sketch is a season 19 episode), The 39 Stairs, and Gone with the Wind (Hulu lists season 19 as the premiere season of the last two mentioned). By season 19 it seems Alistair Cookie has stopped eating his pipe, but still has it present regardless. It seems the pipe is gone in season 20, though it wouldn't be censored for a few years (according to Muppet Wiki there is an episode from the early 1990s featuring Gone with the Wind with the second opening and the original introduction and closing). Among the segments introduced this season include The Taming of the Shoe (according to Hulu) and Guys and Dolls (according to a website I've seen listing songwriting information). Season 21 sees the debut of The King and I, and I've seen scans from an episode script at Mo Williems website which included The Old Man and the C, which listed the debut season, though I can't remember if it said season 21 or 22. The 40th anniversary book mentions that Twin Beaks debuted in season 22. According to Muppet Wiki, the opening changed in 1992, which would be season 23. The new opening is the longest of the three title sequences, panning around a library. I assume it was changed because the actual Masterpiece Theater opening changed. This opening includes references to many past segments, in both the titles on various books and in framed pictures. Besides the segments I already mentioned, this opening includes references to The Sun Also Rises, Hamlet, The Monsters of Venice, Much Ado About Nothing, The Postman Always Rings Twice, and One Flew Over the Cukoos Nest (I think I also spotted a picture of a character from Cyranose de Bergeric). Previously the opening music continued playing as the title sequence faded to Alistair Cookie, but this new opening sequence fades to black, the music now stopping by the time Alistair Cookie is shown. Older segments are now shown with this new opening (and I assume the beginning music when Cookie is shown is removed, and segments ending with the shot of the Monsterpiece Theater title card no longer appearing at the end). According to Hulu, Twelve Angry Men premiered in season 23. At the beginning of this segment, Alistair Cookie says "Me still Alistair Cookie", impling that that's the first segment made after Alistair Cooke left Masterpiece Theater, though I read on wikipedia that he left in 1992, which would make it a little early for such a reference. By 1994, older segments where Alistair Cookie was shown to have a pipe had their intros/closings reshot so that he no longer had a pipe present (1994 was when Sesame Street, Special was released on video, and I read that the video release showed The 39 Stairs with the second opening and the reshot Alistair Cookie scenes). I don't know whether Alistair Cookie's parts of Me, Claudias, Upstairs, Downstairs, Chariots of Fur, or Ali Baba were ever reshot (I think Me, Claudias was retired from broadcasts by the time the opening changed, and Alistair Cookie appears on-screen the whole time in Ali Baba, so either that was dropped or they reshot the whole thing. As for the other two I just mentioned I just don't know whether they redid those scenes; They're the only segments to be shown at sesamestreet.org to include the original title card). Around this time the lighting on the set seems to be darker, and Cookie's chair seems to change from light brown to green (though they could have still used the older chair at times, since it's just a set piece), especially on the reshot intros. Segments that I know have been shown with the second title sequence (but haven't seen the original on): Lethal Weapon 3 (the movie it's based on came out in 1993, which makes season 24 the earliest it could have aired), Little House on Prairie (I first remember seeing that in season 25 or 26, and sesamestreet.org doesn't include the "classic" label on it, the classic label going up to season 24), Monsters with Dirty Faces (this one features a performance by Dave Goelz, who only performed on the show in season 24), Dr. No, Conservations with my Father (which Hulu lists as being from season 25), and Room at the Top. Then the last title card was added, in which the "Monsterpiece Theater" logo appears in front of a green curtain. It's the shortest logo (the first logo lasts 10-11 seconds, the second one 34 seconds, and this one 4 seconds), and the opening music continues to play as the title fades to Alistair Cookie's introduction once again. According to Muppet Wiki this intro was added in 1996 (season 28) and is the only opening that doesn't resemble any actual Masterpiece Theater opening. I assume some segments premiered after this opening was made (I'd hate it if they just changed the opening without making any new segments). This opening is used for the rest of Monsterpiece Theater's run on Sesame Street, though a season 30 episode included The 39 Stairs with the second opening. While I don't know when the last new Monsterpiece Theater segment aired, the segment was last seen in a season 33 episode (I think Guys and Dolls was the last broadcast). It may be redundant to do this, but I'll list the Monsterpiece Theater segments that I've only seen with this third opening, and never with either of the earlier openings: The Horse Whisperer, Little Red Riding Cookie, ABCD Blue (NYPD Blue premiered in 1993), Monster in a Box, and Howards End. As I was planning this post I seeked several segments on YouTube, but there's a few I forgot to seek and can't remember whether I've seen them with any openings that came before the third one. These include Fiddler on the Roof, Anyone's Nose, and Inside/Outside Story. This opening includes references to many past segments, in both the titles on various books and in framed pictures. Besides the segments I already mentioned, this opening includes references to The Sun Also Rises, Hamlet, The Monsters of Venice, Much Ado About Nothing, The Postman Always Rings Twice, and One Flew Over the Cukoos Nest (I think I also spotted a picture of a character from Cyranose de Bergeric). I was just watching this opening again, and spotted a book with "12 Angry Men" written on the spine. Sesame StreetUnpaved has a section on Monsterpiece Theater, including a "Monsterpiece Theater Program Guide". Most of the titles listed are actual MT segments, but there are two segments listed that I know nothing about: Bye Bye Birdie and The Ticklish Patient. I guess those would be rare segments. Looks like I was wrong on something. I previously said that The 39 Stairs debuted in season 19, citing Hulu, but then at Muppet Wiki I saw it listed among the skits in episode 2342, a season 18 episode, and searched the Hulu page, which does list it as coming from season 18. I'd read that the show expanded it's counting lessons from 20 to 40 in 1986, and for some reason I'd spent the last few years thinking that was season 19 (I should have known better). Also, I'd assumed that the Monsterpiece Theater intro first changed when (or perhaps shortly after) the Masterpiece Theater intro changed. But then I decided to seek out some Masterpiece Theater intros on YouTube, and somebody who uploaded the opening that the second Monsterpiece Theater opening is based on mentioned that opening being from 1984. Maybe that's the wrong source but I'll accept it for now (I also viewed the Mouseterpiece Theater opening that resembles it, and I think I read that all episodes of that series are from the 1980s). But I'm pretty sure that the original Monsterpiece Theater opening is based on an actual Masterpiece Theater opening (I saw a Masterpiece Theater parody on SCTV with that type of title card). I think Me, Claudias was retired from broadcasts by the time the opening changed, and Alistair Cookie appears on-screen the whole time in Ali Baba, so either that was dropped or they reshot the whole thing. As for the other two I just mentioned I just don't know whether they redid those scenes; They're the only segments to be shown at sesamestreet.org to include the original title card). Well, that one would have been dropped early on because kids wouldn't understand why Elmo had a different voice there, though they could have just had Kevin loop in the voice like he did in the "We are all Monsters" song. Though I do recall reading on Muppet Wiki that that one was shown with Jerry's Elmo (I think it was Jerry who voiced him there. Either him or Brian Muehl) back in 1988 before Elmo was as popular as he is now. Was just watching Chariots of Fur, and noticed that the window seems to look a bit different from the majority of sketches. Also noticed another bookshelf on the right of the window there. I also noticed that Alistair Cookie's chair was only green in the segments where the intro and outro were redone. Long ago I thought maybe they changed the chair for later segments, though a reason why wouldn't make much sense (that green chair and the usual chair are both used in Ernie and Bert's apartment, plus other segments). But rewatching several, I only noticed that green chair being used in the redone 39 Stairs and Gone with the Wind intros (it's been a long time since I last saw the redone intros/outros from The Sound of Music). But I guess it would make a bit of sense; I assume that when they decided to reshoot the intros and outros they reshot them all in one day. And according to one of the answers (which asks what show was regularly spoofed on the show... Hint, it has something to do with the topic of this thread) "Me, Claudias" was the first. Not sure if the quiz was put out by Sesame Workshop or a fan (considering the quiz has to cite sources, but then again, so do Street Gang and the 40th anniversary book) but I'll accept this answer. Oh yeah I took that recently, I got 81%, lol. Recently, the "trusted sources" that have been used to compile episode pages on the wiki has led to the Monsterpiece Theater page on the wiki list first appearances of several segments (mainly ones that premiered in seasons 22-24). I did ask the person who added the firsts and he said that those sources do indicate if an insert appears for the first time in an episode. Additionally, Muppet Wiki lists taping dates of some segments (and I have seen the clapboard images from some), and I should note that it seems Hulu no longer shows Sesame Street clips but did list what season segments are from. Perhaps a revision is in order. Upstairs, Downstairs - the packaging for the Allistair Cookie plush says that it was the first and debuted in season 10. Many of us thought it was incorrect for a number of reasons (for one, this one has the regular opening sequence/title card while "Me, Claudias" does not, so it's fair to have assumed that one came before), but a few years ago, it turned out that somebody had a copy of a season 10 episode with "Upstairs, Downstairs", so I believe it now (I also must add: if there was a Monsterpiece Theater segment in season 10, they should have made it a bonus feature on the second Old School volume!). Me, Claudias - season 11, according to Old School Vol. 3. Chariots of Fur and The Sound of Music - both would have debuted between seasons 13 and 15, since the Cookie Monster puppet in these was built in season 13 and the earliest known appearance of both are season 15 episodes. The 39 Stairs - as I said previously, Hulu cites season 18 as the premier season. In addition to that, season 18 is the earliest it would have come (since that's when the show started to teach numbers higher than 20), but most importantly, the taping date is sometime that year. Gone with the Wind - season 19, according to Hulu as well as the date on the clap board (which I have also seen an image of). Ali Baba and the 40 Thieves - earliest would be season 18 (since, as I said previously, that's when they started to teach higher numbers than 20) and latest would be season 20 (since that's the earliest known appearance to the wiki), I still assume it's from season 19 but don't have a solid source. The Taming of the Shoe - season 20, according to Hulu. Guys and Dolls - season 20, according to a website with songwriting information. The King and I - season 21, and probably the most sourced in terms of seasons. There's the timeline at the end of The Street We Live On (as well as the updated timeline on the disc that came with the 40th anniversary book), 40 Years of Sunny Days lists it as from season 21, Hulu listed it as season 21, and the taping date is 1990 (before season 21 ended). Twin Beaks, Monsters of Venice, and The Sun Also Rises - season 22, as Muppet Wiki lists episodes from that season as the first appearances. 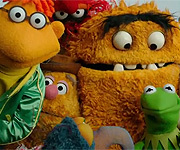 Twelve Angry Men, Much Ado About Nothing, Waiting for Elmo, Cyranose De Bergerac - Muppet Wiki lists season 23 episodes as their first appearances. Lethal Weapon 3, Hamlet, Inside/Outside Story, Monster in a Box, Monsters with Dirty Faces, Room at the Top - season 24, Muppet Wiki lists episodes from that season as the first appearances (and as I said before, Dave Goelz performs in Monsters with Dirty Faces, and Goelz only performed in season 24). The Horse Whisperer - season 30, Muppet Wiki lists an episode from that season as the first appearance. And it must be the last one, as all other known Monsterpiece Theater segments have either a "first" or "eka" and if there were any Monsterpiece Theater segments that premiered after that date I doubt we wouldn't know about them. I previously said that the earliest known appearance of Ali Baba was a season 20 episode, but recently looked and saw that its earliest known appearance was actually a season 19 episode (that had been on the wiki for years). I recently saw on the wiki that One Flew Over the Cuckoos Nest, The Old Man and the C, and The Postman Always Rings Twice debuted in season 21. I thought I saw a long time ago that Chariots of Fur was in a late-1990s episode (I'm thinking season 27-29) and therefore the opening and closing would have been reshot, but looking at the image on the wiki and seeing what episodes the wiki lists it in, combined with the fact that the Wiki now has full rundowns for every episode past season 22, I saw that the most recent episode listed on the wiki to have the image is from the 1980s. If it was in a late-1990s episode, I doubt the wiki page would be lacking that picture (though I recall when I saw, or thought I saw, such a page that it didn't include pictures). Muppet Wiki has full episode rundowns for every season 13 episode, neither Chariots of Fur or The Sound of Music appeared in any episodes from that season, so their debuts would have to have been in either season 14 or 15 (the earliest known appearance of both are season 15 episodes).